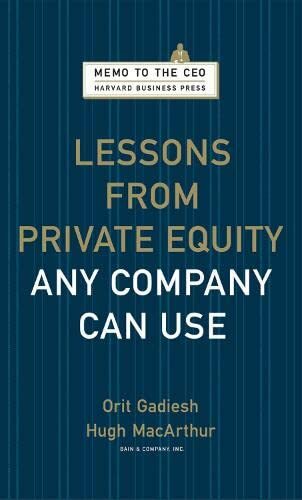 [PDF] Lessons from Private Equity Any Company Can Use (Memo to the CEO) | Free eBooks Download - EBOOKEE! Description: Product Description: Private equity firms are snapping up brand-name companies and assembling portfolios that make them immense global conglomerates. They're often able to maximize investor value far more successfully than traditional public companies. How do PE firms become such powerhouses? Learn how, in Lessons from Private Equity Any Company Can Use. Bain chairman Orit Gadiesh and partner Hugh MacArthur use the concise, actionable format of a memo to lay out the five disciplines that PE firms use to attain their edge: AÂ· Invest with a thesis using a specific, appropriate 3-5-year goal AÂ· Create a blueprint for change--a road map for initiatives that will generate the most value for your company within that time frame AÂ· Measure only what matters--such as cash, key market intelligence, and critical operating data AÂ· Hire, motivate, and retain hungry managers--people who think like owners AÂ· Make equity sweat--by making cash scarce, and forcing managers to redeploy underperforming capital in productive directions This is the PE formulate for unleashing a company's true potential. From our new Memo to the CEO series-- solutions-focused advice from today's leading practitioners. No comments for "[PDF] Lessons from Private Equity Any Company Can Use (Memo to the CEO)".